Three Wives. Three families. Three troubled marriages. 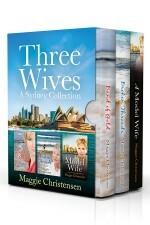 Set on Sydney’s North Shore, this collection of full-length novels explores the challenges faced by three wives in their families and marriages. Anna’s safe and secure world collapses when her husband of twenty-five years leaves her on Christmas Day without warning or explanation. Blame competes with grief as Jan’s life descends into chaos after losing her son. In order to make a fresh start, Celia attempts to extract herself from a toxic marriage and hold her family together. Uplifting stories of second chances.